One of the things that I wanted to understand and build since I first learned to program was to build a chat client. Something that would allow people to communicate and I am extremely thankful to Rishav Rastogi for introducing me to XMPP. I never really understood all the moving parts very clearly during my first interaction with the technologies but with some time on my hands now I decided to revisit the entire process of building a web chat client. While there are a few well documented resources that cover how to build a simple web chat client the information is mostly directed towards using XMPP and building a one-on-one chat. Though the requirements for building a multiuser chat aren’t significantly different there are subtle differences that exist. Ejabberd is an XMPP server that I used to build my chat client with. Since this post would be using Rails we use the xmpp4r gem which is a wrapper over the standard XML that XMPP/Jabber/Ejabberd uses, thus allowing us to work with Ruby rather than generate XML. For those using Ruby 1.9.2 the gem installation may throw up some errors while installing the Rdoc so I’d recommend you either skip the Rdoc installation or ignore the error. The online documentation for Xmpp4r is pretty good and the gem comes with some useful examples that could help you get started. Why do we need Orbited? With our existing arrangement (once we install Ejabberd and xmpp4r gem) we could get a basic messaging system ready. We could have users send messages and receive messages. The problem would be to receive those messages on the browser. There is no way we can display those messages without having to poll our server to fetch this information and we know polling could cause scalability issues. Orbited fills this void by acting as a web router that routes the incoming messages to the appropriate user’s browser using a technique called as long-polling. And long-polling is more scalable than polling. Comet is a broad term used for technologies like Long-Polling and streaming. While traditional polling requires periodic requests to be sent to the server and then return with the response, in long-polling a connection is established with the server which persists until a response is provided (or the request times out). Once the response is provided the connection is closed and a new one is step up waiting for the next response from the server. Similarly a new connection is set up on timeout. In Streaming the connection persists between the client and the server while the information is transferred. According to HTTP 1.1 a browser is allowed to have only 2 connections to the server one of which is used here for real time communication, though I am not fully clear if this is exactly the way the connection is setup. Apparently IE 8 allows 6 connections per host so I shall look forward to any clarifications on this. Orbited comes with support for technologies such as STOMP, IRC and XMPP so its a handy tool to get started with. bundle install and your ready. You can download the installer from here. At the time of this tutorial the lastest version was 2.1.6. Domain: siddharth-ravichandrans-macbook-pro.local This is simply a name (domain name) that you would want your server to be known by. In production this could be chat.example.com or jabber.example.com. For development the default is good. Its important that you note down the domain name somewhere as you will be using this a lot. Thats it, you have your ejabberd server installed. Now open the folder you installed it in and navigate to the bin folder. Now that we have confirmation that our server is running log onto http://localhost:5280/admin to access you admin interface. You may log in as [AdminUser]@[domain] followed by the password. # once the sockets are open, orbited will drop its privileges to this user. For the reactor epoll would the one to select on Linux machines and Kqueue for OS X but I noticed that Kqueue has not been maintained and throws errors so using select is the last resort. Though select has scalability issues its okay to use it for development. Set the user to the user that you would want orbited to run as. Thats it, orbited is ready. Give it a go by typing ‘orbited’ in the console. You should see the server start. Once you’ve conquered the basics of user subscription and sending messages lets take a look at the Multi User Client support provided in Xmpp4r. 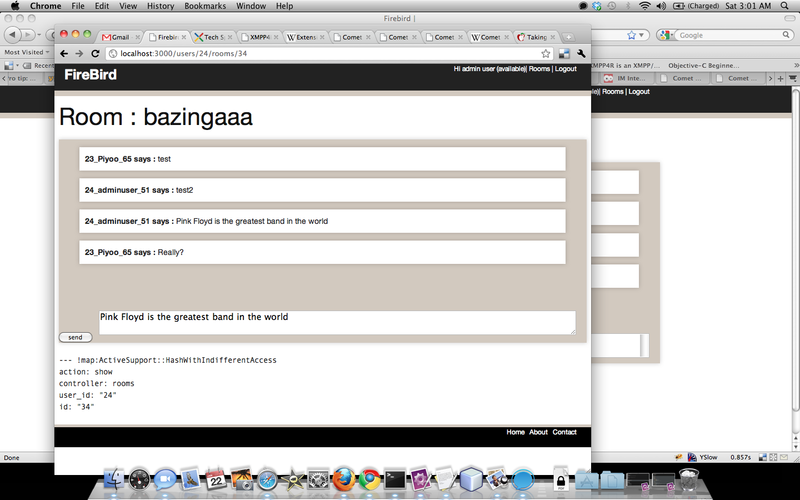 Registering our users to the Jabber server. Ideally this would be after a user registers to your site, so an after_create operation. The MUC Client is a multi User chat Client. The XMPP4R gem provides support for MUC too. The MUC is not to be confused with the room. Its simply a client that serves as an interface for the user in a particular room. This lets the user join a room called chatroom and the user is logged in to the room as client.jid.node which evaluates to first_user in our case. The callbacks like the one described earlier in François Lamontagne’s two part tutorial get called when a new user joins the chat room, sends a message to the room or leaves the chat room. The MUC chat is actually very similar to the one – on – one chat example described in François Lamontagne’s example except that when a message is directed to the room it relays the message to all of the members in the room. So if you look at the xml you will notice that a message directed to the room is eventually directed to each user in the chatroom. The only difference is the send method which belongs to muc object takes care of the relaying or you may query the roster (I will come to this in a moment) to identify the members in a room and post a message to each member. The MUC roster is extremely useful and allows you to set callbacks too. This pretty much wraps my example using Ejabberd and XMPP4R. The next part of my post will briefly describe how we can use orbited and have this information flow through the browser. So first lets make these two files available to our application by putting them in a layout file. You will notice two partials at the bottom of my layout file called _tcpsocket and xmpp_client (both poorly named). Before we begin try running this snippet obtained from Micheal Carter’s Sockets in the Browserarticle on CometDaily.com. Add this snippet to the _tcpsocket.html.erb partial that is included in the layout. Load a view page (which includes the layout containing this parital). It could be any scaffold generated code block. This would be a helpful example to understand better what Orbited does. All it does is opens a tcp socket on localhost and connects to port 5222 . The onopen callback is called when the connection is opened and sends a piece of text which is read by the onread callback and the connection close callback is called. Basically reading the data whenever something is sent by the server while waiting for it with an open socket connection is what we do. The xmpp.js file is where all the magic (not really) happens. If you notice these methods end up generating the exact same XML code (converted to utf8) and sent to the ejabberd. So no real magic there. Note that the xmpp.js file has been modified slightly from what Orbited provides us and the _xmpp_client.html.erb uses this modified api hence the method parameters may appear strange when compared with the original xmpp.js file. 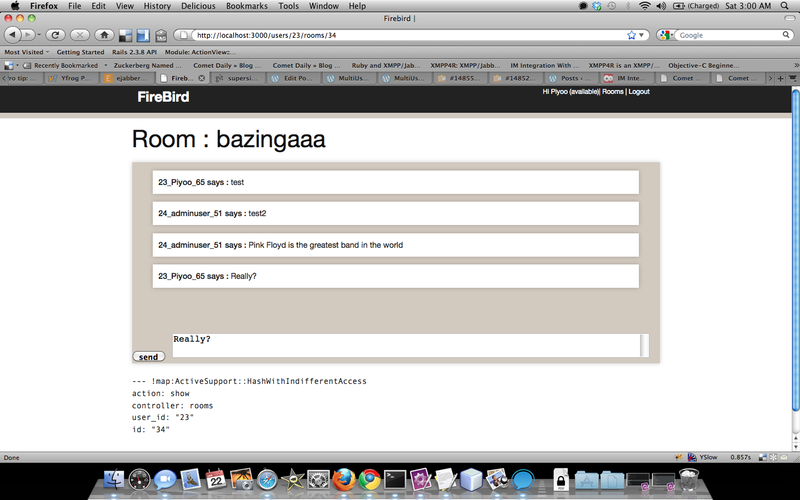 The ROOM_NICK parameter is defined in the view using a content_for :js block and would be available inside a chat room. I hope this is useful and please let me know of errors or misinformation in my article. In case you are interested in having a detailed write up on the installation of all the software, add a comment and I will send you the write up as soon as possible. I have tried my best to attribute most references to their original authors and sources but in case I have forgotten any I would be glad to update it anytime.